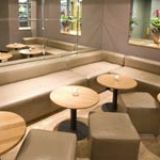 Zander Bar is nestled nicely within The Bank Restaurant and has a stylish and funky interior. It remains a popular venue due to its wide range of cocktails, vibrant atmosphere and delicious modern dishes on the bar menu. What did you think of Zander Bar? Bank Westminster zander bar london were very welcoming, nice relaxed atmosphere, food excellent, would certainly recommend it. Really nice bar snacks, the sausage rolls and the Chips and curry sauce are great! Amazing cocktails and bar food - best place for after work drinks in Victoria! Zander is a local bar to me and I think it is a great place to go. It's good for chilling out with mates and it's also good for dancing and listening to great music. The bar staff are friendly and so are the customers. It's a great place to go. The Zander cocktails are fab and they also sell specialist drinks that you can't get in other bars and pubs! The Zander Bar was the best night of my life - such great music, atmosophere, amazing cocktails and loads of celebrities. I can't wait to come back to the Zander Bar! Food at the Zander Bar is absolutely brilliant and the service was excellent. The staff are very friendly at Zander. For a Saturday night the atmosphere in the Zander Bar was somewhat lacking. The supposed longest bar in Europe is really not so impressive and certainly not interesting enough to make up for the fact that the place is devoid of any character. As we sipped our tasty, but extortionate cocktails I had the sense that we could have just pulled up some chairs and been sitting in a hallway, except for the odd wall that had been constructed around us, to separate this area from the rest of the bar. The saving grace was the great company, and also the toilets...which are rather swanky. 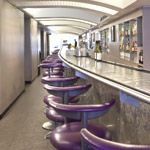 From its never-ending bar to its futuristic décor, the Zander Bar is never anything less than a thoroughly enjoyable assault of the senses. 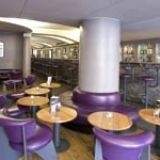 Located in the heart of Westminster and a five-minute walk from Victoria station, the Zander Bar is part of the Bank Restaurant, itself part of an imposing network of eateries, flats and hotels halfway down Buckingham Gate. A revolving door leads through the open-front exterior into a dimly-lit anteroom, with the restaurant straight ahead and the bar to the right hand side. Two huge flowerpots are offset by wall-length mirrors, framed pictures and thick pillars which divide the space nicely. With a low, recessed ceiling, concealed lighting and padded, futuristic chairs and sofas, the Zander Bar is as good a place as any for post-office gatherings, garbled conversations and a cocktail or three from one of the longest bars in the UK. Truly a sight to behold, the eponymous bar extends the length of the room, with every conceivable kind of spirit on display – room to manoeuvre is limited, however, as much of the space directly in front of it is given up for two private rooms which are usually assigned to groups with the foresight to book in advance. The downstairs space, a short walk from the initial welcome area and cloakroom, is almost as large as the first floor, yet oddly it houses the toilets and very little else. Loud, brash and generally convivial, the Zander cannot be faulted for sheer post-work atmosphere – the waistcoated staff respond well to rush hour, and drink orders are dispatched courteously and stylishly, while the well-to-do clientèle make merry in the natural enclaves that form around the pillars throughout the room. The frenetic choice of music is tailored to the occasion, with guests DJs on Friday nights, and the pervading ambience is one of unabashed hedonism. Although food is usually left to the Bank Restaurant just next door, the Zander Bar offers selected bar snacks as well, and in keeping with the rest of the menu they are gloriously excessive. The mini-basket of fish and chips is a meal in itself, and the jumbo sausage roll is more satisfying than a jumbo sausage roll has any right to be – all for fairly reasonable prices (£5-£7), and an undoubtedly alluring gateway to the delights of the restaurant itself. Using every last spirit in its considerable arsenal, the Zander does a mean line in cocktails, some of which are available at heavily discounted rates (£4.25) from 4pm onwards in the much-vaunted ‘Cocktail Club’ series – favourites include Tommy's margarita, espresso martini and the tequizzle. Champagne cocktails are equally popular, if a little pricier – although a bellini comes at a more-than-reasonable £8.50, the same price as a regular glass of champagne. Wines are in abundant supply too – although the house red is a rather disappointing South African shiraz (£4.75 a glass) so by all means splash out or the Chilean cabernet sauvignon (£5.95) – whilst Bitburger on draught, as well as several bottled brands (£4), round out the beer list. Despite a respectable location and demure exterior, the Zander Bar is brash, bold and busy – a good place to see out the working week in Westminster.